By November 29, Dr.Nalin Samarasinha a senior scientist at the Planetary Science Institute in Houston, Arizona, felt like he had been on a rollercoaster. As Star gazers, professional and amateur alike, waited with bated breath to hear of ISON’s fate, reports began to pour in. A few hours before, the comet had attained perihelion, skimming a perilous 730,000 miles from the surface of the sun, moving faster than 217 miles per second through the Sun’s searing atmosphere. When it didn’t come out from the other side, the news was greeted with disappointment but not surprise. However, Dr. Samarasinha soon heard from colleagues who reported ISON had survived…after a fashion. After perihelion, a very faint smudge of dust appeared in the LASCO C2 images along ISON’s orbit. This surprised us a little, but we have seen puffs of dust from Sungrazer tails, so it didn’t surprise us enormously and didn’t change our diagnosis. We watched and waited for that dust trail to fade away. Except it didn’t,’ wrote researchers on the website of the NASA Comet ISON Observing Campaign. ‘Now, in the latest LASCO C3 images, we are seeing something beginning to gradually brighten up again. One could almost be forgiven for thinking that there’s a comet in the images!” They end the post by declaring ISON has ‘unquestionably been the most extraordinary comet’ they’ve studied. Dr. Samarasinha knows only that we don’t know what to expect of this unpredictable celestial object. “ISON is not fully gone but is in a different form,” he noted in an email to the Sunday Times.Multiple factors are helping decide ISON’s fate, including its size, dynamics and composition. Forced to study it from afar, astronomers noted its early brilliance as it entered the hearth of the inner Solar System for the first time. Interested in studying the comet, Dr.Samarasinha helped set up The ISON Worldwide Coma Morphology Campaign (http://www.psi.edu/ison) which invited observers from across the world to submit images of the comet to the researchers. The goal was to study the structure of the comet’s coma – that fuzzy halo of vaporised gas and dust that develops around the nucleus as the comet begins to heat up. “The coma’s structure can be used to guess how fast it is rotating and what activity you have in the nucleus,” says Dr. Samarasinha. As ISON plummeted toward the bright centre of the Solar System, radiation pressure and solar wind brought force to bear on it, creating the long tail that streamed away from the Sun. The same is true of ISON, even if we eventually confirm its untimely demise. In that final phase, the forces acting on the comet multiplied tremendously. “It is a completely different scenario when compared with a few months back. Say even 1 ½ days prior to perihelion it was ten times further away from the Sun and the amount of light and energy it was exposed to was a hundred times less.” Under such conditions, as temperatures soar, metals in the nucleus typically begin to sublime directly – transforming straight from solids to gases without going through a liquid phase. Though we may not have the pleasure of looking up to see the ‘comet of the century’ blaze across our night skies, there’s still enough to keep scientists busy. As Dr. Samarasinha notes, a sun-grazer like ISON is of interest not just to cometary scientists but to scientists studying solar activity as well – to the latter, the comet serves as a natural probe. 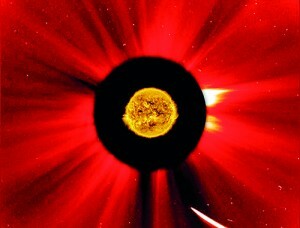 “Even if it gets completely disrupted, we will learn many things – such as the actual nuclear composition, constraints on the nuclear structure, how solar wind and magnetic fields would interact with the disrupted comet as currently most solar missions are observing the comet.”While comets hailing from the Oort cloud are common enough, the fact that this was ISON’s first visit to the solar system also makes it a comet of interest. While its fate is still up for debate and will only become clear in the days that follow, ISON’s popularity a lesson in astronomy in the age of Twitter. The comet’s ubiquity on social media promises that such celestial events will reach larger audiences than ever before, inspiring excitement around cutting edge science and research. And as ordinary people look to the skies themselves, they’ve become a new resource for professionals who are increasingly finding room for amateurs among their ranks. Published in the Sunday Times, Sri Lanka on 1 December, 2013. Words by Smriti Daniel.